Good news to all our PISO FARE friends! Are you still looking for lowest fare for your trips to Batanes, Boracay, or Coron? Excited? Read on this post regarding the Skyjet Seat Sale 2016- 2017 that will be available when you visit the Skyjet Airlines booth during the 27th Philippine Travel Mart on September 2-4, 2016. Their booth is located at Island Pavilion (IP06). This year, the Philippine Travel Mart will be held in SMX Convention Center, located at Seashell Lane, Mall of Asia Complex, Pasay City. You can fly to your dream destination via this Skyjet promo. One-way trip to Boracay is as low as P427+ per way. 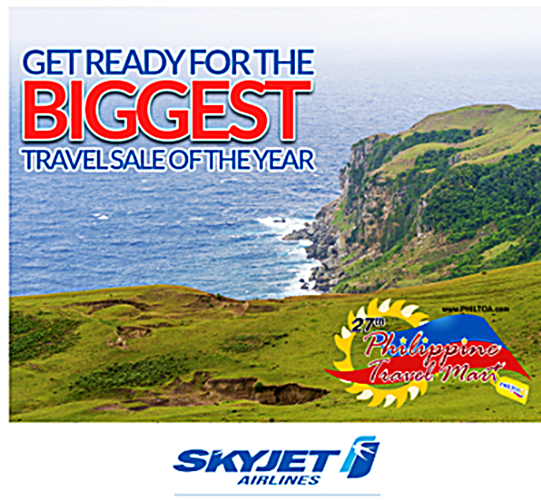 Flights to Coron will cost P627+ per way while Skyjet promo to Batanes is as low as P727+ per way. The quoted Skyjet promo ticket refers only to the base fare; the taxes and fees are not included yet. The Skyjet low fares from this promo are valid for travel starting October 1, 2016 until September 30, 2017. The promo selling is September 2-4, 2016 during the 27th Philippines Travel Mart. Visit the Skyjet booth as soon as the Travel Expo opens because Skyjet sale tickets are LIMITED and sell like hot cakes! Free 5 kilos hand carry baggage is covered in the Skyjet promo fare. For checked baggage, the ticket includes free baggage of 10 kilos for adults and 5 kilos for children. Excess baggage rates is at P150 per kilo including the VAT. Skyjet Promo Tickets are non-transferable, non-refundable, non-reroutable, non-rebookable and non-endorsable. Be ready with your travel dates and visit the Skyjet Airlines booth at IP06 as soon as the Philippine Travel Mart 2016 is open to the public on September 2-4 from 10AM-8PM. Entrance fee is P50.00 per person. LIKE and FOLLOW PISO FARE TICKETS on Facebook for more promo fare and affordable travel to BATANES, CORON, BORACAY and other destinations!! !